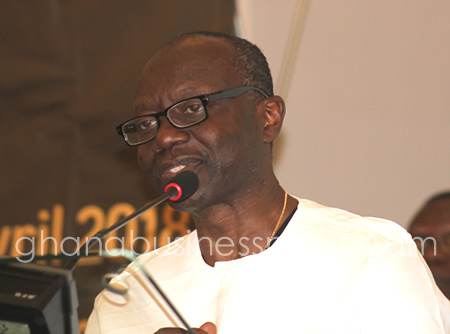 Ghana’s economy has performed well in the first nine months of 2018 and is on track to meet the set targets, Mr. Ken Ofori-Atta, Minister of Finance, has said. The 2018 budget statement projected an overall GDP growth rate of 6.8 per cent (5.6 per cent in the rebased series), non-oil GDP growth of 5.4 per cent (5.8 per cent in the rebased series), end-period inflation of 8.9 per cent, fiscal deficit of 4.5 per cent of GDP (3.7 per cent in the rebased series), a primary surplus of 1.7 per cent of GDP (1.4 per cent in the rebased series) and gross international reserves to cover not less than 3.5 months of import cover. According to data available as at the end of September 2018, Real GDP grew by 5.4 per cent (using rebased series) in the first half of 2018, compared to the annual target of 5.6 per cent. Non- oil real GDP grew by 4.6 per cent compared to the target of 5.8 per cent; while end-period inflation rate declined from 11.8 per cent at the end of 2017 to 9.8 per cent at the end of September 2018; and further to 9.5 per cent as at October 2018. “The fiscal deficit was 3.0 per cent of rebased GDP at the end of September 2018 compared to a target of 2.7 per cent and the primary balance was a surplus of 0.5 per cent of rebased GDP compared to a target of 0.9 per cent of rebased GDP for the period,” he added. The public debt, including the financial sector bailout costs, at the end of September 2018 was 57.4 per cent of rebased GDP. Excluding bailout costs, the debt was 53.9 per cent of rebased GDP. The monetary policy rate dropped from 20 per cent at the end of 2017 to 17 per cent at the end of October 2018. Ghana’s provisional trade balance for the period also recorded a surplus of $1,617.81 million compared to a surplus of $777.82 million recorded for the same period in 2017 while gross International Reserves accumulated to $6,756.43 million, sufficient to cover up to 3.6 months of imports, ahead of the 2018 target of 3.5 months. “The performance of the economy for the first nine months has been impressive,” he said. The exchange rate, which appreciated against the US dollar up to May 2018, depreciated by 7.57 per cent at the end of Sept 2018, largely on account of external pressures, including the strengthening of the US dollar, the US-China trade war, and the US Fed policy rate hikes. “Compared to other emerging economies, Ghana has been able to weather the storm a lot better, primarily due to strong economic fundamentals,” noted Mr. Ofori-Atta. The post Finance Minister says Ghana’s economy in 2018 impressive appeared first on Ghana Business News.